If you get a chance to visit a Body Worlds exhibition, it will not only fascinate but also instruct you on body mechanics and the concept of referred pain syndromes. These are real cadavers, without the formaldehyde smell. It is not postmodern art, but postmortem—lifeless bodies in beautiful athletic pose, as if reanimated. This is where body mechanics is visualized, and you see the connections beneath the skin. Shown here is a female archer after the release of a drawn arrow. It is a good demonstration of a repetitive motion that can not only cause a rotator cuff injury but also referred pain that can mislead into thoughts of either a deltoid or arm strain/tear. Referred pain can be due to a transfer of abnormal forces along connective tissue planes (confounding with adjacent muscles), nerve impingent (confusing pain signals along the length of a nerve), and/or to a tendency to look at the surface (where outer-layer muscle groups may obscure the injured muscle beneath). The rotator cuff is a group of 4 muscles that stabilize shoulder joint movement. In the case of the archer, two of these rotator cuff muscles are recruited: infraspinatus and teres minor. Both can refer pain to the shoulder or arm. Of the two, an infraspinatus strain would present with a broader area of pain. I will focus on the infraspinatus because it is the most visible rotator cuff muscle (in the photo). Unfortunately, due to copyright, I cannot modify the image to point to the infraspinatus. So I have to articulate. From the right shoulder area: the upper trapezius connects the deltoid (shoulder muscle) to the nape and spine. The lower section of the trapezius overlaps the latissimus dorsi (lat), which is the broadest muscle of the back. The deltoid, trapezius and lat together form a triangular window into another layer of muscles. The largest visible muscle within that window is the infraspinatus, which fuses to the shoulder blade and also attaches to the humerus bone (arm). It is one of the main actors responsible for drawing back an arrow. 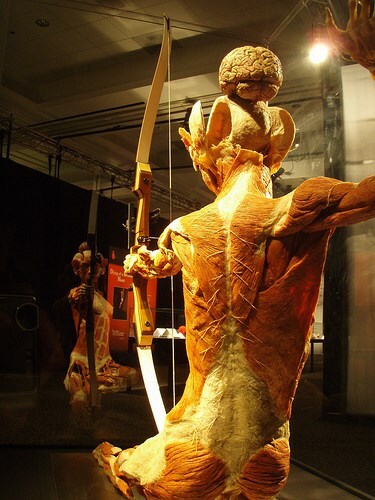 Of course, you do not have to practice archery in order to injure the rotator cuff. And though repetitive motions increase the chance of injury, even weekend warriors (involving minimal repetition) can suffer acute injury due to poor muscle conditioning or trauma. Injury to the infraspinatus is not only painful itself, but can lead to nerve impingement (and more pain) due to a subsequent abnormal range of motion in the shoulder joint. As mentioned above, because this muscle is obscured, it can also lead to a perception of pain in the deltoid muscle that lays over it. All of our muscles are integrated via a continuous sheath of connective tissue (called fascia). Tension due to muscle strain can travel along this sheath to areas away from the primary injury, thus furthering a referred pain pattern. Acupuncture treats rotator cuff injury and pain by relieving tension around the site of injury to allow muscle recuperation. It also restores balance among the 4 muscles of the rotator cuff for well-coordinated movement of the shoulder joint, thus relieving any nerve impingement. Rotator cuff injury is responsive to acupuncture—without surgery—as long as the injury does not involve a substantial muscle tear. 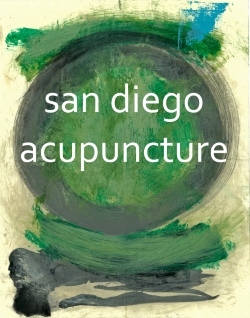 Next post: Traditional Chinese Medicine Inc.